I think I fall in love with Berlin. The city has so many things to tell you. So much proud, so much pain…so many struggles… Yet, It still stands as the most powerful European city (I point this as economical and political power). I’ve lived in Germany for 5 months as Erasmus Student (European Union Exchange Student Program) I was in Karlsruhe. I visited couple of cities while I was in Germany but I didn’t have a chance to go Berlin when I was in there. Fatih has never been to Germany either. SO we think It is great opportunity to go a place we both never been there for this fall. We were planning to go to Germany 2 weeks earlier but visa situation made us later. So if you need to get a visa for the place you want to go check the appointments 2 months in advance. We plan to stay in Berlin for 3 days then our road goes to Prague. I think 3 days are the perfect time for Berlin if you also plan to go some other places. You have a clear idea of Berlin with 3 days. We stayed in Mitte with Airbnb. I wasn’t so thrilled about the house we stayed but the neighborhood was amazing. It remind me Williamsburg. You can basically walk to everywhere easily from Mitte and you can find cute boutiques to some in this neighborhood. What I love more about Mitte are food and vintage shops. We found so many Paleo, Vegan and gluten free options in Mitte. And you can find tone of vintage stores in the streets of Mitte. An the people of Mitte are generally from all around the world. We even met with couple of fellow Americans in this area. So I highly recommend you to stay in Mitte. Our path crossed Alexander Platz almost every time when we try to find our way to other neighbors. Alexander Platz remind me Union sq.So many train connections and big malls located around it and of course October Fest market.We use this train station for going everywhere. After settle down, we visited legendary Berliner Dom in our first day. The day started really cold but weather opened later same day. We thought why not directly go to Berlin wall if we have this gorgeous weather. 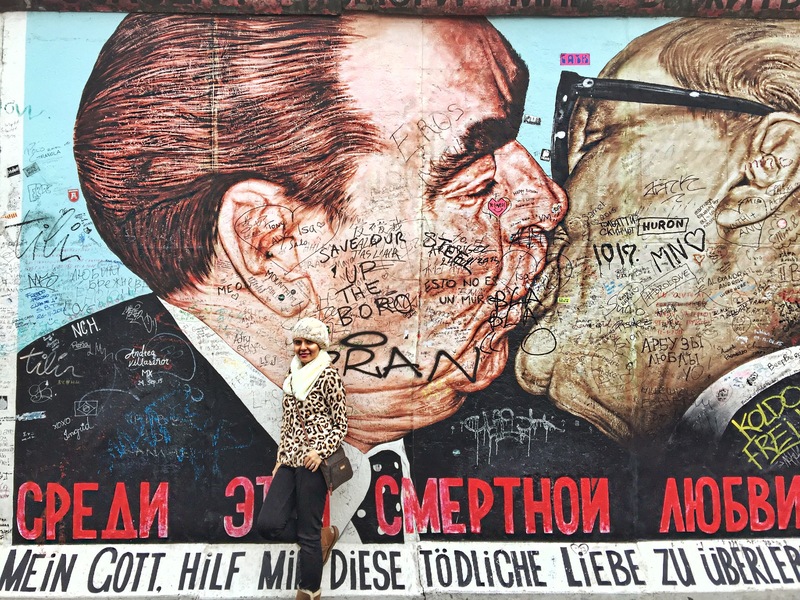 After we visited DDR museum, we went to famous street art heaven Berlin Wall. It was really sad to see how German people live for a while, together but apart. On our last day we sent some time around very famous place called Kreuzberg. We walk around the neighborhood and see very famous place Check Point Charlie. This city makes you question about human drives. There to much sadness and feelings all around this city. Anyways we learned earlier that there is this really famous doner (similar to gyro) place called Mustafa’s Gemuse (vegetable) Doner in Kreuzberg. Even Elon Musk visited same place one week before us. We understand how important to try this place. We are lucky that we are from New York and we know how important waiting for a really good food. We knew that we have to wait at least 1 hours for this doner. This is the first time ever I waited too long for a food. Worst part is the weather was too cold. I started to not feel my hands at the end of this crazy adventure but we did it! We got our best doner ever in our lives! Berlin welcomes us perfectly, we can’t wait for our next trip to Berlin. I promise next time will be summer! !